My first car was a v´65 Ford Fairlane wagon. It was a fairly simple--albeit large--vehicle. I could even do some of the work on it myself. There was a lot of room under the hood and few electronics. The only engine sensors were a temperature gauge and an oil-pressure gauge. Things are very different with my v´99 Volvo. There’s no extra room under the hood--and there are lots of electronics. And then there are all those little warning lights sensing so many different aspects of my car’s function that they have to be connected to an internal computer to determine what’s wrong. Cars have undoubtedly improved over my lifetime. They are safer, more comfortable, and more reliable. The engineering is better. But I’m not sure these improvements have much to do with all those little warning lights. Check-engine lights--red flags that indicate something may be wrong with the vehicle--are getting pretty sophisticated. These sensors can identify abnormalities long before the vehicle’s performance is affected. They are making early diagnoses. I probably have a few check-engine lights on myself. I’m a male in my midfifties. I have not seen a doctor for a routine checkup since I was a child. I’m not bragging, and I’m not suggesting that this is a path others should follow. But because I have been blessed with excellent health, it’s kind of hard to argue that I have missed out on some indispensable service. Click hereto read an pp-ed piece by Dr. Welch in the New York Times Aug 20, titled "Testing What We Think We Know"
Dr. H. Gilbert Welch on the Thom Hartmann Program, February 16th, 2011; click here to listen. 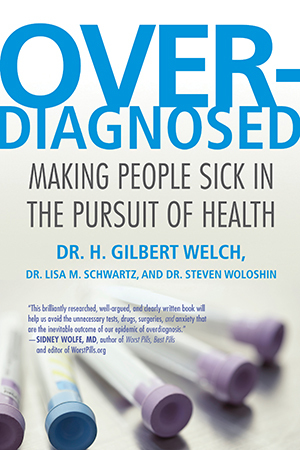 Click here to watch an author appearance on PBS's P "Money & Medicine"